Ensinger, Inc. with its North American headquarters in Washington, Pennsylvania, processes high-performance engineering plastics. Combining its extrusion, casting, compression and injection molding proficiency with its knowledge of high-performance polymers and applications, Ensinger aims to expand into the engineering plastics market. Ensinger’s expertise lies in analyzing part design and matching proper materials and process combinations to fit application criteria. Ensinger partnered with Organizational Development Consultant David Rea of Catalyst Connection to undergo DDI’s Success Profiles, Leadership Mirror and Leadership Training offerings to enhance its organizational strength and to develop a common language around its corporate culture. These curricula allowed Ensinger employees to not only identify the core competencies needed for their role within the organization but to also understand their unique strengths and to highlight opportunity areas for personal development. Ensinger launched the first wave of its engagement with members of its senior management team to gain “top-down” buy-in on the importance of the outputs of the program. 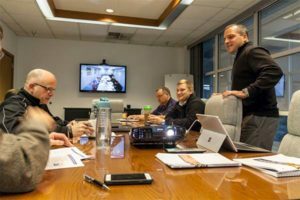 The DDI suite has since been deployed to a second round of employees, with further waves planned in upcoming months.